In New York, Sandra Steingraber, who is with New Yorkers Against Fracking, claimed that the state's ban against fracking is not a loss for women. She claimed that 95% of the jobs created in the fracking industry are for men, while the leftover 5% of jobs for women are only for hotel maid and prostitution. "Fracking" is the popular name for hydraulic fracturing, a process through which natural gas is extracted by pumping high-pressure water into layers of stone, which breaks up the stone and releases the natural gas. In December 2014, the Governor of New York, Andrew Cuomo, announced his decision to ban fracking in the state after considering representations from environmental experts. "I cannot support high-volume hydraulic fracturing in the great state of New York", he said. "I think it’s our responsibility to develop an alternative … for safe, clean economic development." In actual fact, there had been a moratorium on fracking in New York since 2008 for authorities to study its impact on the environment. In February 2015, fifteen towns in New York threatened to secede from that state to join its neighbour, Pennsylvania, where fracking is allowed. A spokesperson for the group, Mr. Finch, said: "There are no jobs. The economy is terrible. There's nothing going on." The towns reside on the Marcellus Shale, which is rich in natural gas. What Is Shale Gas and Why Is It Important? Shale gas refers to natural gas that is trapped within shale formations. Shales are fine-grained sedimentary rocks that can be rich resources of petroleum and natural gas. Sedimentary rocks are rocks formed by the accumulation of sediments at the Earth's surface and within bodies of water. Common sedimentary rocks include sandstone, limestone, and shale. Over the past decade, the combination of horizontal drilling and hydraulic fracturing has allowed access to large volumes of shale gas that were previously uneconomical to produce. The production of natural gas from shale formations has rejuvenated the natural gas industry in the United States. The virtues of natural gas. The US Government's Energy Information Administration noted that natural gas is a clean burning fuel, generating less CO2 emissions than coal and other petroleum products. However, natural gas, made up mostly of methane, is also a greenhouse gas. This means that natural gas must be flared up at most drilling sites. The fracturing of wells requires large amounts of water. In some areas of the country, significant use of water for shale gas production may affect the availability of water for other uses, and can affect aquatic habitats. If mismanaged, hydraulic fracturing fluid—which may contain potentially hazardous chemicals—can be released by spills, leaks, faulty well construction, or other exposure pathways. Any such releases can contaminate surrounding areas. Hydraulic fracturing also produces large amounts of wastewater, which may contain dissolved chemicals and other contaminants that require treatment before disposal or reuse. Because of the quantities of water used and the complexities inherent in treating some of the wastewater components, treatment and disposal are important. According to the United States Geological Survey, hydraulic fracturing "causes small earthquakes, but they are almost always too small to be a safety concern. In addition to natural gas, fracking fluids and formation waters are returned to the surface. These wastewaters are frequently disposed of by injection into deep wells. The injection of wastewater into the subsurface can cause earthquakes that are large enough to be felt and may cause damage." Natural gas may be released to the atmosphere during and after well drilling, the amounts of which are being investigated. 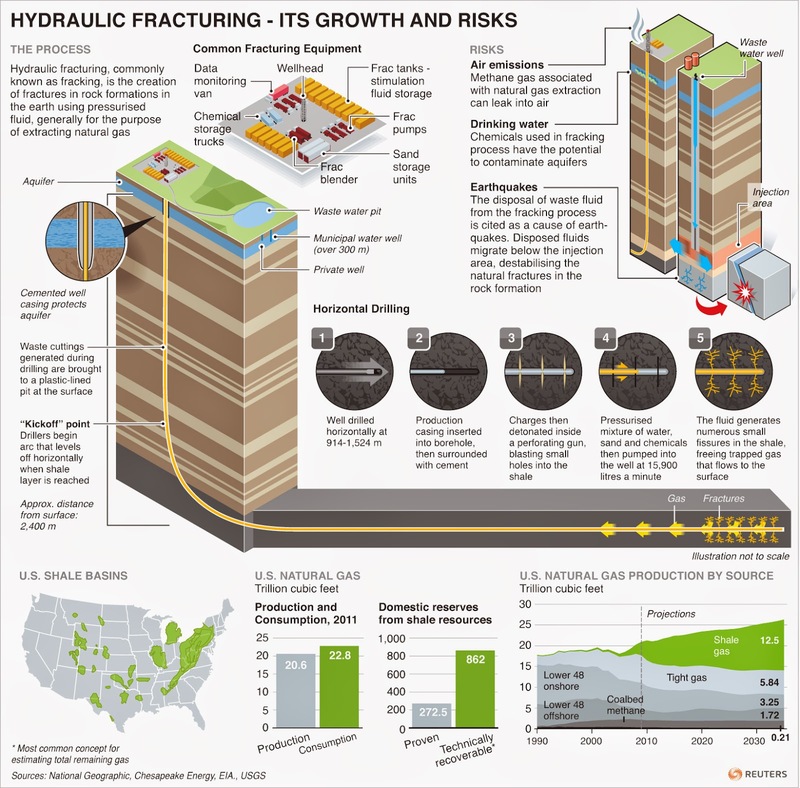 Hydraulic Fracturing - Its Growth and Risks. Prepared by Reuters. How to survive a lay-off in the oil and gas industry. The origin of the burning platform metaphor. Some thoughts on car pooling. Styrofoam and an eco-friendly alternative. I just learned about fracking and the topic looks very interesting.